In the article, How to Secure a Well-Chosen Domain Name, we covered the basics of domain names including what they are, why they are important, and how they work. Once you’ve decided on your perfect domain name, you have to register it to secure it. Registering a domain name grants exclusive rights of use to the legal owner of the domain name. That’s where a domain registrar comes in. A domain registrar is a business that provides domain registration services to the public. Buying a domain name is similar to buying insurance – you have access to the benefits of your ‘policy’ PROVIDED the payments are current. The moment you miss a scheduled payment, the policy lapses and you lose rights to its use. Domain names are available for purchase on an annual basis with a minimum of 1 year required. As long as you continue to renew your domain name with the domain registrar, you have rights to use it. Domain Registrar: How to Choose? As in any business sector or industry today, you have a MULTITUDE of choices when looking for a place to register your domain name. Below, we discuss some vital aspects you should consider BEFORE choosing a domain registrar. YOUR choice of domain registrar will depend on a variety of factors including whether you will be purchasing domains in bulk, whether you have ethnocentric preference to buying local, or whether you like all your web tools under one roof. While choosing a domain registrar is not on the same level as choosing a life partner, you can save yourself a lot of time, hassle, and money by NOT jumping into a relationship. 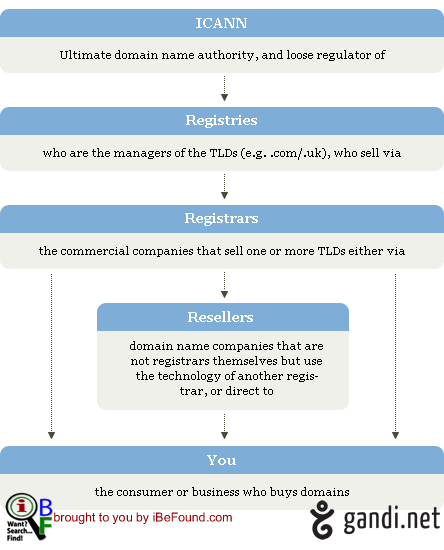 OR, you can use the following criteria to make a well-informed decision on which domain registrar is right for you. The Internet Corporation for Assigned Names and Numbers (ICANN) is an internationally recognized, not-for-profit corporation with participants from all over the world dedicated to keeping the Internet secure, stable and interoperable. It has the responsibility of overseeing the allocation of IP addresses and managing the Domain Name System which is the backbone of the World Wide Web. ALL reputable domain registrars will be accredited/certified by ICANN and/or by the registry in charge of the gTLDs or ccTLDs that they sell. The Accredited Registrar Directory is a list of ICANN-accredited domain registrars that is regularly updated. So, the very first thing you should do when checking out a domain registrar is to determine whether or not they are accredited by ICANN or other relevant registry. When it comes to purchasing almost any product or service today, you should heed these admonitions: “expect the unexpected”, “better safe than sorry”, “prevention is better than cure”. So, make sure that your domain registrar offers a sound support system. There should be an easy to find contact page containing a number of ways to contact them. 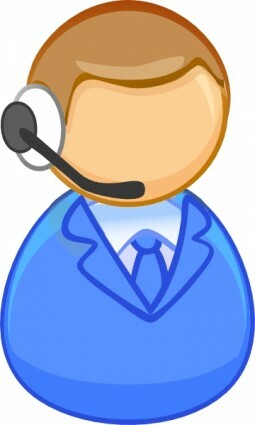 Test their response time by contacting them through a couple of their support methods. Do a search for online reviews and/or complaints to see what others have to say. Keep in mind that people only tend to leave reviews when the service is very good or very bad. So, be wise and weigh the reviews accordingly. Every domain name consists of TWO parts. DOMAIN NAME = NAME + EXTENSION. Make sure that the domain registrar that you are leaning towards provides the type of TLDs you want now and in the future. Do an image search for the domain management interface for each of the domain registrars on your shortlist to see what they look like. Try searching for phrases like “crazydomains manage domain” or “godaddy domain interface” (WITHOUT quotes). Prices of domain names vary by domain extensions and from registrar to registrar. Fortunately, long gone are the days of paying US$100/yr for an basic unregistered .COM domain name. Nowadays, the price for new no-frills .COM domain registrations falls in the range US$8 – $40 (approx. NZD$10 – $50) . Anything less than these minimums is usually an introductory/discounted price, or part of a hosting package. When it comes to pricing, you must look at the rates for new registrations as well as for renewals. If you are moving your existing domain names from one registrar to another, you also need to check out the transfer rates. There is rarely ever a NEED for the extras that might be offered when attempting to purchase a domain name. Remember to only buy what you need. 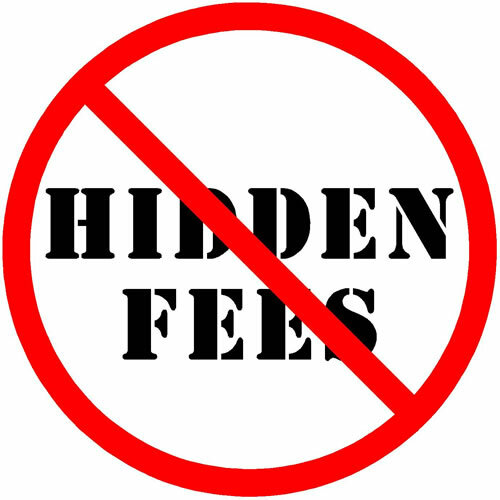 Some unscrupulous domain registrars tack on additional costs for things like setup fees, DNS management fees, or profile management fees. It’s like a car dealership saying: now that you’ve bought the car, you have to pay extra to start the engine, to let someone drive it, to get permission to wash it, etc. If these are not included in the domain price, think twice before choosing that registrar. Be sure to read the fine print so that you don’t end up paying more than you bargained on. 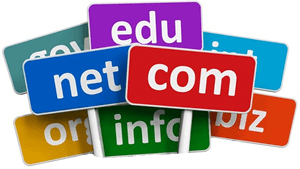 There are a few other things you should keep in mind when registering your domain name. Consider this scenario: you give someone money to purchase a car on your behalf. However, the person puts their name on the title instead of yours. Who legally owns the car? – The one who paid for it or the one whose name is on the title? In the world of domain names, legal ownership of a domain name belongs to the one who is listed as REGISTRANT in the WHOIS record for the domain name. Do you currently have a website? Do YOU own the domain name or does it actually belong to your web designer/developer? It is imperative that you take a moment to verify the ownership of your domains. Please refer to the resources below for more information on doing this. In your domain management account, you should have full control over the renewal settings of your domains. To protect against the possibility of losing your domains by forgetting to renew them, you may want to set the renewal to automatic for at least one year at a time (more if you can). It should be noted that with some domain registrars, automatic renewal takes place 30 or 31 days PRIOR to the actual expiration date of the domain. It is YOUR responsibility to know how automatic renewals are handled at your chosen domain registrar. Be sure to keep track of renewal dates so that you can ensure you have available funds. You might want to use a browser extension like Reminderfox, or Checker Plus for Google Calendar™. 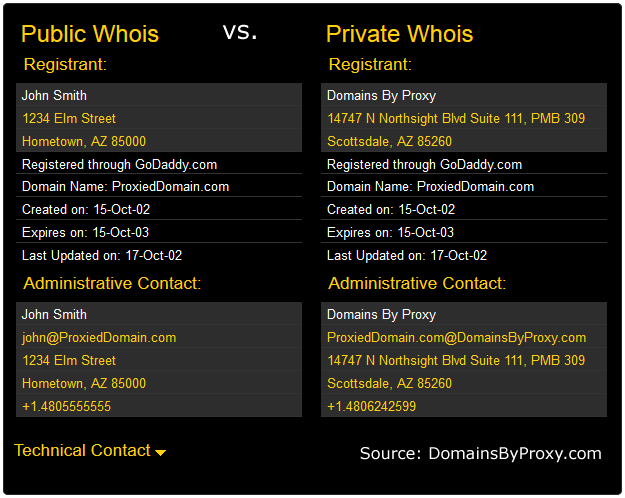 This information is then made visible to the public via a WHOIS lookup. In fact, its available to everyone including marketers, spammers and even identity thieves. In an effort to protect one’s privacy, many domain registrars offer domain privacy services. At most domain registrars, this comes at an extra charge, while there are a few registrars who believe that domain privacy should be included FREE with each domain. a spam-protected email used exclusively with your domains. Recently, a multitude of new gTLDs (generic Top Level Domains) like .auto, .construction, .health, .travel, .lawyer were made available for domain registrations. When it comes to the security of your business, stick with what works. As far as domain names go, the .COM is the most popular and universally recognizable domain extension. It is the one that has been etched into people’s minds. The one they subconsciously add when typing a web address. The only one which has its own keyboard shortcut on many mobile devices. So, for the sake of your business, your choices for domain extensions should be .COM and/or your ccTLD (country-code Top Level Domain). Any other extensions should be extras. Physical addresses are simply a man-made way of differentiating one location from another, but they are not the same as the land or building at that location. Some domain registrars also offer web hosting services and some web hosting companies also offer domain services. The choice to have your domain and web hosting needs cared for by the same company is entirely up to you. However, do NOT buy web hosting with your domain registrar UNLESS they meet the criteria for good web host providers as discussed in the article, Is Your Web Hosting Provider Proving its Worth? To significantly cut down the time you will spend searching for a quality domain registrar, I’ve gone ahead and compiled a list of reputable businesses that provide domain registration services. I’ve even gone one step further and grouped them by geographic regions for those who prefer to deal with a locally-based business. Head on over to Local Domain Registrars Based in Top Regions Worldwide to get started on your hunt for a quality domain registrar. Also, visit our “Domain Name Guidelines” board on Pinterest for some more insights. Follow iBeFound International Ltd’s board Domain Name Guidelines on Pinterest. So, is YOUR domain registrar proving its worth? How or Why not? What do you think about domain privacy? Business Owners: Are you considering using any of the new gTLDs?